Many individuals who are lawfully present in the United States are eligible for health coverage through Medicaid, the Children’s Health Insurance Program (CHIP), or subsidized plans in federal and state marketplaces. 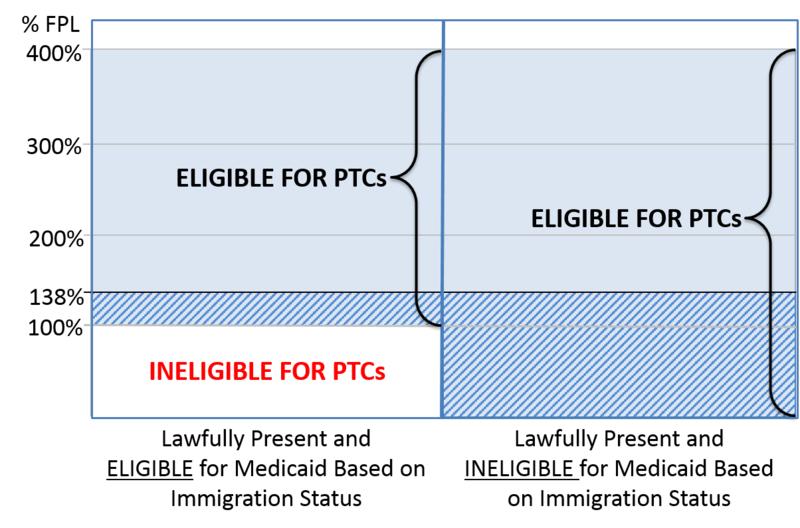 All U.S. citizens are eligible for these coverage programs, but eligibility rules for non-U.S. citizens differ for each program. What are the immigration status requirements for Medicaid and CHIP? 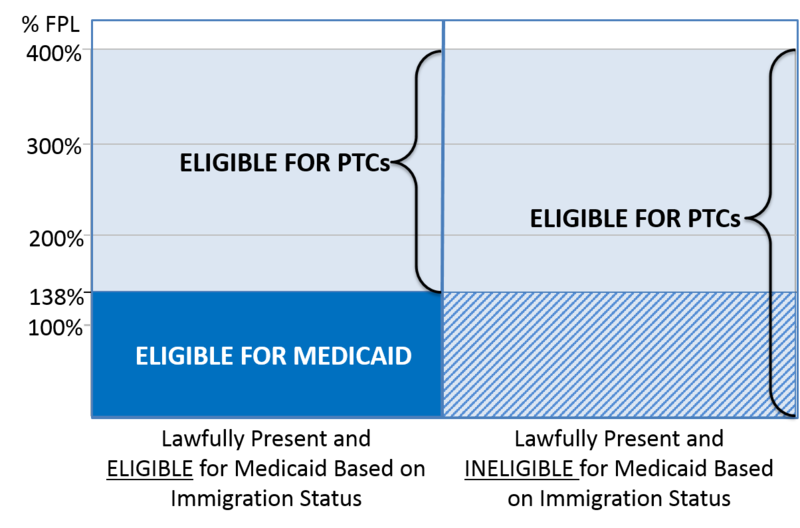 Immigrant eligibility requirements for Medicaid and CHIP originate from the Personal Responsibility and Work Opportunity Reconciliation Act (PRWORA) of 1996. PRWORA created two categories of immigrants used in determining Medicaid eligibility: “qualified” and “not qualified” immigrants. In general, immigrants must be in a qualified status to be eligible for Medicaid and CHIP. However, even qualified immigrants may not be eligible because they have not met a five-year waiting period after they obtain qualified status. Individuals who are not eligible for Medicaid because of their immigration status may be eligible for Medicaid payment of emergency services, and some may be eligible for marketplace coverage. Additionally, states have the option to adopt broader eligibility rules for immigrant children and pregnant women. Which categories of immigrants are “qualified” immigrants? Certain trafficking survivors and in some cases their spouses and children (for adult victims) and spouses, children, parents and minor siblings (for child victims). All other immigrants are considered not qualified for purposes of Medicaid and CHIP eligibility. Are qualified immigrants eligible for Medicaid or CHIP immediately upon obtaining a qualified status? It is important to note that a few states restrict eligibility for some qualified immigrant adults even after the five-year wait. Can states have less restrictive eligibility requirements for immigrants? Yes. States have the option to provide Medicaid and CHIP coverage to “lawfully present” children and/or pregnant women. The term lawfully present includes all qualified immigrants, as well as many other types of immigrants who have permission to live or work in the United States. (See Table 1 for a full list of immigration statuses considered lawfully present for the purpose of enrollment in insurance affordability programs). States can also use CHIP funding to provide prenatal care to women who are otherwise ineligible for Medicaid and/or CHIP under the CHIP unborn child option regardless of their immigration status. In addition, some states use state or county funds to provide Medicaid and CHIP to other groups, such as lawfully present immigrants who do not have qualified status and to children who are undocumented. What are the immigration requirements to enroll in a Marketplace plan? Only lawfully present individuals can enroll in a marketplace plan. (See Table 1 for a list of immigration statuses that are considered lawfully present for the purpose of marketplace eligibility). In general people permitted under the law to be in the U.S. meet the requirement, but there are some exceptions. An important exception is individuals granted deferred action under the Deferred Action for Childhood Arrivals (DACA) program. The U.S. Department of Homeland Security can grant temporary administrative relief from deportation, which is referred to as deferred action, for a variety of reasons. While individuals granted deferred action are generally eligible to enroll in marketplace coverage, DACA recipients are excluded and not eligible to enroll in a marketplace plan. What are the immigration requirements for premium tax credits and cost-sharing subsidies in the marketplace? People who are lawfully present are eligible to purchase marketplace coverage. Once these requirements are met, individuals who don’t have other minimal essential coverage may also qualify for premium tax credits and cost sharing reductions if they meet financial requirements. In general, only individuals with incomes between 100 and 400 percent of the poverty line are eligible for premium tax credits. However, an individual who is lawfully present and not eligible for Medicaid because of her immigration status can qualify for premium tax credits even if her income is below the poverty line (for example, a lawfully present immigrant who is not qualified or is qualified but in the five-year waiting period). While Medicaid income eligibility differs in states that expand and those who do not, eligibility for premium tax credits for lawfully present immigrants with incomes below the poverty line is not affected by a state’s decision on Medicaid expansion (see Figure 1). How are premium tax credits calculated for lawfully present people with incomes below the poverty line? For the purposes of determining a person’s expected contribution to the cost of coverage, the portion of income he will contribute is the same as for individuals with incomes at 100 percent of the poverty line, which is 2.03 percent of income. For example, if his income is $10,000, then his expected premium contribution is $203 per year (2.03 percent of $10,000). His premium tax credit will be the cost of the second-lowest silver plan available to him minus his expected contribution. What options for coverage do undocumented individuals have? Undocumented individuals and individuals excluded from insurance affordability program such as those in the DACA program are eligible for Medicaid payment for services in situations defined as emergencies in the Medicaid law, including labor and delivery. They are not eligible to purchase health insurance through the marketplace, but they may obtain private coverage outside the marketplace with no government-sponsored subsidy. There are no immigration status requirements for certain public health services including immunizations as well as services provided by Federally Qualified Health Centers, migrant and rural health centers, and hospital charity care. In addition, some states provide coverage of prenatal services to women regardless of immigration status, and a few states and local governments extend health coverage to undocumented children and/or some non-citizen adults using state funds. Undocumented individuals also can sign up for employer-sponsored insurance if their employer offers it. For more information on how states restrict coverage, see footnotes 6 and 7 on the National Immigration Law Center document, “Overview of Immigrant Eligibility for Federal Programs, available at: nilc.org/document.html?id=108. Center for Medicaid and State Operations, State Health Official Letter #09-006, May 8, 2009: www.medicaid.gov/Federal-Policy-Guidance/downloads/SHO050809.PDF. This percentage is indexed and will change each enrollment year.